I’ll be signing books this weekend in Perrysburg, OH at the Authors & Dancers Against Cancer event. Hope to see you come there to support this great cause. Tickets to the event can be purchased here. 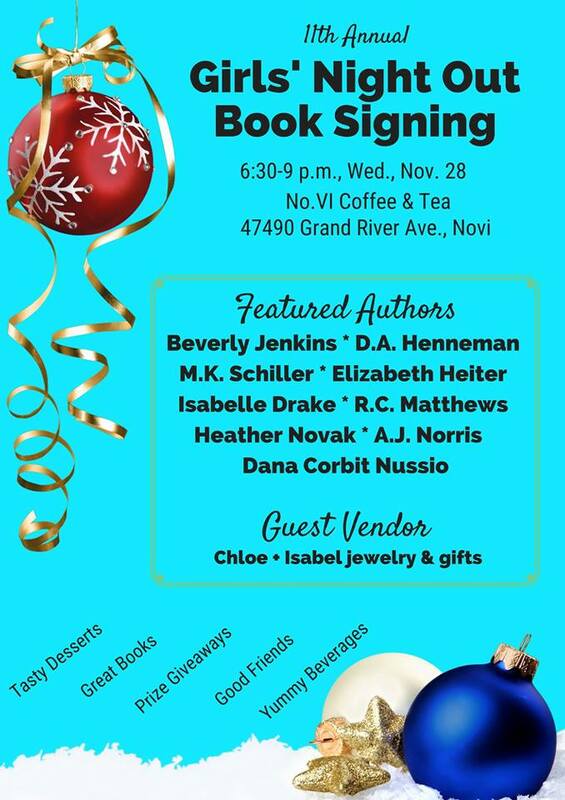 Girls' Night Out - Book Signing Event! I’ll be there with paperback copies of my new release The Secrets of Chateau Swansea! Hope to see you there. New Release - Enter the Giveaway! Meanwhile, devoted steward of thechateau Arthur Dunn plays a dangerous game of deception to shield his employer’sgood name, landing himself at the top of Maribeth’s suspect list. of the hired hack. Stop the coach! She grasped the handle to the door. What are you doing? her friend shrieked, tugging on Maribeth s sleeve. We must leave at once. You heard the gentleman. The chateau is closed to visitors. Wait here, Maribeth said, jumping from the moving coach. I’ll only be a moment. Where do you think you’re headed? The surly man from the road glared at her, his steely blue eyes boring into hers. He was so close she could make out the silver whiskers interspersed in his black sideburns. I beg your pardon, she said, yanking free of his hold. I m here to offer my services. Where might I find the master of the house? That s enough, Webber, another man said from behind. I’ll handle this matter. I apologize if Webber alarmed you, Mr. Dunn said, folding his arms at the base of his lower back. The butler is distraught at present. What can I do for you, Miss? Maribeth Sommerset, she said with a lift of her chin. And you are Mr. Dunn. You stole my hired hack earlier at the Inn at Oxwich. Don t even try to deny it. The bellman confirmed the truth. That wasn’t well done of you! His eyebrows lifted, and a spark of amusement ignited in his lovely brown eyes. I beg to differ, madam. Hired hacks are, by definition, for hire. The driver accepted my generous offer to pay a premium fare. Even so, she said, tugging on her gloves, I m sure the bellman informed you that the hack was ordered by me and my dear friend. You should be ashamed of yourself. He coughed into his hand and glanced away, but not before she saw the undeniable curve of his lips. Running off with a lady s carriage wasn’t amusing. After months of planning this trip, she’d almost missed her opportunity to tour Chateau Swansea on his account. Excuse me, he said, meeting her gaze once again. I do apologize for any inconvenience. I m the steward of Chateau Swansea and had urgent business to attend here. Apology accepted, she said with a smile. There was no reason to quibble over a silly coach. She thrust the card into his hand. As I said, I m Miss Maribeth Sommerset. Private psychic investigator, at your service. She gestured to the group of men near the pond. I communicate with the dead. I m staying at the Inn at Oxwich through Saturday should you need my assistance. My rates are reasonable and negotiable. To check the latest tour schedule, visit The Secrets of Chateau Swansea Book Page at Book Unleashed. R.C. Matthews is the author of contemporary and historical romances featuring bold, sassy heroines and magnetic alpha heroes. Warning! The chemistry between her characters is off the charts hot, so read at your own risk. She resides in the Midwest and is surrounded by men: her husband and three sons. During her free time, you’ll find her watching The Walking Dead, reading a fabulous book or hanging out with her family. 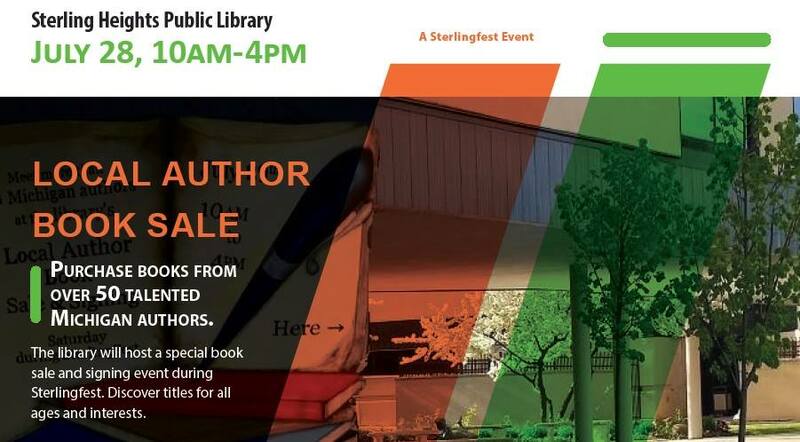 Visit with over 50 Michigan authors at the Local Author Book Sale outside the Sterling Heights Public Library on Saturday, July 28 from 10 AM – 4 PM. during Sterlingfest. I’ll be there with copies of all of my books! Now in its 4th year, the Local Author Book Sale is held on the covered walkway between the Sterling Heights Police Station and the library. We’re only steps away from the Sterlingfest craft fair, south of Utica Road and west of Dodge Park Road. Readers can browse books from various genres including children’s books, romance, mysteries, thrillers, science fiction, fantasy, adventure, memoirs, and more. Talk with the authors, see the books available for purchase, and have your books signed by the author/illustrator. Fun for all ages. Are you a fan of Romance and New Adult books? Do you love that swoony feeling you get when you read about a couple in love? Our Romance Book Festival is for you! 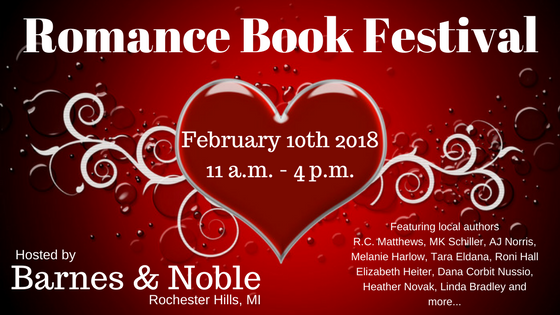 Join us at Barnes & Noble in Rochester Hills, Michigan for an exclusive FREE event on February 10 from 11AM – 4PM as we celebrate Romance authors and the books you love to read! Join your favorite romance authors for Q and A panel discussions, fun games, great prizes, and author signings. Over 15 authors, representing various romance genres from sweet to spicy, contemporary to historical, and laid-back to packed with suspense! See below for details. I am proud to announce we are teaming up with Oakland Literacy Council as our charity for this event. The Oakland Literacy Council provides basic literacy and English language instruction to adults in order to facilitate lifelong learning, employment skills and personal well-being. Barnes and Noble will donate a portion of the profits from our book fair to Oakland Literacy Council. WORKSHOPS AND PANEL EVENT TIMES COMING SOON!